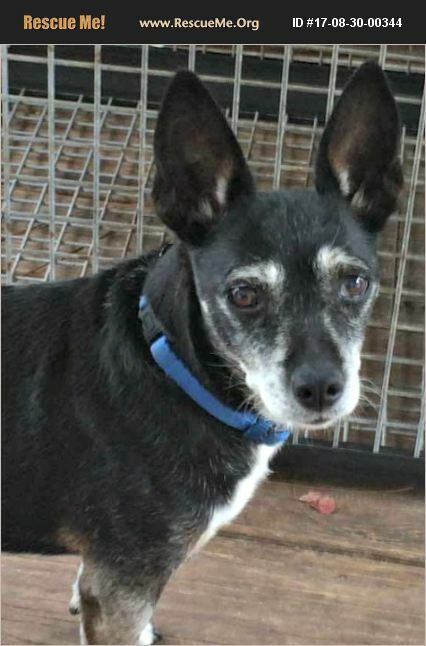 Cuppy is fostered in Bradenton, FL (Manatee County). We are a foster-based rescue and always looking for fosters! Cuppy, short for Cupcake, was pulled from a local shelter along with her friend Angel. She is a senior chi mix, and just as sweet as can be. Still has the right bit of sass left, as she will dance and bark at suppertime or walk time. She will go in a crate, she is housebroken and walks well on lead. We are working on commands. Another little lap girl, and she does just fabulous with other dogs. Seems to have some age related cataracts noted, and will need a dental soon. I have noted her back legs shake a bit when she dances around a lot, but she has shown no lameness and runs around the yard exploring it all. She is not noise-phobic and doesn't seem to mind the rain. This is what I would call a good dog. Nothing really bad to say about her, she will be a great companion dog. We were informed that she was bonded to Angel but I am not seeing that. They are eating separately by their own choice and sleeping separately. If you are looking for a small dog that will appreciate love, walks, light activity and car rides, this is your girl! Cuppy is spayed, up-to-date on vaccines and preventives, heartworm negative and microchipped. Her standard adoption donation is $250, but she can be adopted for $150 through our Seniors for Seniors program (65+).